What is The HBO Addiction Project and how is NIDA involved? What are the costs of substance abuse to society? Where can I learn more about the science of drug addiction? What are withdrawal and detoxification ("detox")? Other than addiction, what are some other health consequences of abusing drugs? When is the best time to get someone into treatment? NIDA is one of the 27 Institutes and Centers comprising the National Institutes of Health (NIH), U.S. Department of Health and Human Services. NIDA is the largest supporter of the world's research on drug abuse and addiction. NIDA-funded scientific research on illicit and prescription drugs, as well as on nicotine, addresses the most fundamental and essential questions about drug abuse, including tracking emerging drug use trends, understanding how drugs work in the brain and body, developing and testing new drug treatment and prevention approaches, and disseminating findings to the general public and special populations. The HBO Addiction Project is a multimedia venture that includes a centerpiece documentary, supplementary materials, a website, and a book. This monumental project was done in partnership with NIDA, the National Institute on Alcohol Abuse and Alcoholism, and the Robert Wood Johnson Foundation. The purpose of HBO's Addiction Project is to provide the public with an in-depth picture of the science of addiction, treatment, and recovery, with contributions from the Nation's leading scientists and the personal narratives of addicts and their loved ones. As the foremost expert authority on the science of drug addiction, NIDA's scientists and staff worked closely with HBO to provide an accurate and comprehensive picture of the current science on drug addiction. By recommending the most appropriate scientists to feature in the documentary, including our Director, Dr. Nora Volkow, providing research-based information about addiction, and fact-checking much of the information HBO is distributing through this project, NIDA sought to ensure that HBO's contribution to the public's understanding of drug addiction was based on research. While NIDA is a proud partner in this project, it was not funded by NIDA, and the views expressed in the documentary and other materials are not necessarily those of NIDA. Overall, the results are positive - an approximate 23% decline over the last five years in the past-month use of any illicit drug by students in the 8th, 10th, and 12th grades combined (see figure). Cigarette smoking continues to fall to the lowest rate in the survey's history. And, between 2001 and 2006, declines were observed in daily cigarette use among 8th, 10th, and 12th graders. These findings are particularly noteworthy since tobacco addiction is one of the leading preventable contributors to many of our Nation's health problems. 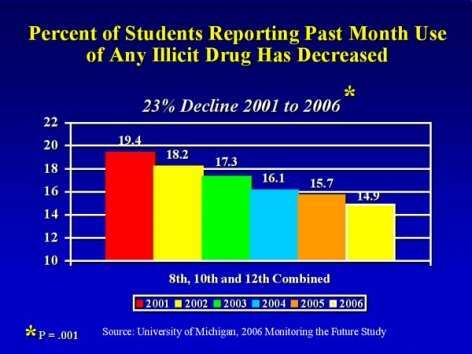 Between 2001 and 2006, marijuana use within the past month declined by nearly 25% for 8th, 10th, and 12th graders combined. Lifetime, past-month, and past-year use of marijuana decreased among 8th, 10th, and 12th graders separately, and daily use decreased among 10th graders during the same time frame. Since 2001, lifetime, past-year, and past-month steroid use decreased among 8th and 10th graders; lifetime use of steroids also decreased among 12th graders. Lifetime, past-year, and past-month use of MDMA (Ecstasy) decreased among 8th, 10th, and 12th graders from 2001 to 2006 - by more than 50% on most measures. Methamphetamine abuse continues to decline - on all indicators for each grade since 2001; and past-year and past-month use declined among 10th graders between 2005 and 2006. Lifetime and past-year use of alcohol modestly decreased among 12th graders, but remains prevalent. While past-year OxyContin abuse was down among 12th grade students - from 5.5% in 2005 to 4.3% in 2006 - the rate nearly doubled among 8th graders between 2002 and 2006 - from 1.3% to 2.6%. Vicodin continues to be abused at unacceptably high levels - 9.7% for 12th graders, 7.0% for 10th graders, and 3.0% for 8th graders. A question on the non-medical use of over-the-counter cough or cold medicines was added to the survey in 2006, with nearly 7% of 12th graders reporting past-year abuse of cough or cold medicines to get high. Although overall rates are stable, 8th graders, at 9.1%, continued in 2006 to have a higher rate of past-year use of inhalants compared to 10th and 12th graders, at 6.5% and 4.5% respectively. This is one of the few categories in which 8th graders report higher rates of abuse than 10th and 12th graders. Attitudes toward substance abuse, often seen as harbingers of change in abuse rates, were mostly stable. However, among 8th graders, perceived risk of harm associated with MDMA decreased for the second year in a row, and disapproval of using MDMA also decreased this year. Attitudes about risk of harm and disapproval of using LSD also softened among 8th graders this year. Estimates of the total overall costs of substance abuse in the United States - including health- and crime-related costs as well as losses in productivity - exceed half a trillion dollars annually: approximately $181 billion for illicit drugs, $168 billion for tobacco, and $185 billion for alcohol. $36 billion in other costs, such as efforts to stem the flow of drugs. For more details on the economic cost of drug abuse, visit http://www.ncjrs.gov/ondcppubs/publications/pdf/economic_costs.pdf (PDF, 999KB). Other effects such as crime, accidents and homelessness. Further, substance abuse and addiction start early and can tragically alter the course of a young person's life. These costs cannot adequately be measured, but nonetheless have a devastating impact. Office of National Drug Policy (2004). The Economic Costs of Drug Abuse in the United States: 1992-2002. Washington, DC: Executive Office of the President (Publication No. 207303). 2004. Centers for Disease Control and Prevention. Annual Smoking-Attributable Mortality, Years of Potential Life Lost, and Productivity Losses - United States, 1997-2001 Morbidity and Mortality Weekly Report 54(25):625-628, July 1, 2005. Harwood, H. Updating Estimates of the Economic Costs of Alcohol Abuse in the United States: Estimates, Update Methods, and Data Report prepared by the Lewin Group for the National Institute on Alcohol Abuse and Alcoholism, 2000. 2000. In 2007, NIDA released a comprehensive booklet Drugs, Brains, and Behavior: The Science of Addiction. This booklet aims to help people understand why individuals become addicted to drugs. How can I receive education materials regarding drug abuse? NIDA's website is a tremendous resource for educational materials. For print copies of publications, NIDA maintains an online publications catalog; orders can be placed by calling DrugPubs at 1-877-NIDA-NIH (1-877-643-2644). Many of our publications are available in both English and Spanish, and most of these materials are free of charge. For teachers and students, our NIDA Goes Back to School section provides a wealth of educationally appropriate materials, including curricula, posters, booklets, and other educational materials developed in collaboration with Scholastic Marketing Partners, part of Scholastic, the global children's publishing and media company. Drug addiction is a chronic, relapsing disease that affects the brain and causes compulsive drug craving, seeking, and use despite harmful and often devastating consequences. For more information, see Drug Abuse and Addiction: One of America's Most Challenging Public Health Problems (Archives). Addiction is considered a brain disease because drugs change the brain - in structure and in function. It's true that for most people, the initial decision to take drugs is voluntary. Over time, however, the brain changes that occur with drug abuse erode a person's self control and ability to make sound decisions, while prompting intense urges to take drugs. Imitating natural neurotransmitters (chemical messengers in the brain). Because of the similarity in chemical structure between certain drugs (such as marijuana and heroin) and the neurotransmitters naturally produced by the brain, drugs are able to "fool" the neurons into sending abnormal messages via the network. Over-stimulating the reward system by flooding the circuit with dopamine, which is a neurotransmitter present in regions of the brain that regulate movement, emotion, motivation, and feelings of pleasure. Nearly all drugs of abuse directly or indirectly increase dopamine signals in the reward pathway. Some drugs, particularly stimulants like methamphetamine, cause nerve cells to release abnormally large amounts of dopamine, whereas others, such as cocaine, prevent the normal recycling of dopamine, which is needed to shut off the signal between neurons. This is a difficult question, and the answer is complex. We know that many factors affect vulnerability to addiction and protection from it. These include: the drug itself and how it is taken (smoked, swallowed, injected), how often, and how easy it is to get; individual differences based on genes, gender, age, and other events in a person's life, including past experiences; and cultural/societal factors related to norms, economics, and legal consequences, for example. And this is only a partial list. Biology. People with a family history of addiction to drugs or alcohol may have an increased genetic risk for becoming addicted - it is estimated that genes account for about half of this vulnerability. But it is not only having these genes that matters, it is how they interact with other biological (e.g. gender, ethnicity, mental illness) and environmental (e.g. stress, poverty, drug availability) factors that accounts for a person's vulnerability to addiction. Even with no family history of alcohol or drug addiction, an individual is not safe from addiction; anyone who uses drugs, regardless of family history, is at risk. So while genes play a significant role, they do not by themselves determine whether someone becomes addicted. Environment. A person's environment includes many different influences - from family and friends to socioeconomic status to quality of life in general. Factors such as peer pressure, physical and sexual abuse, stress, and parental involvement can greatly influence the course of drug abuse and addiction in a person's life. Development. Drug abuse and addiction typically begin in adolescence and sometimes even earlier. Research shows that the younger a person is when they start using drugs, the greater his or her chances of developing later drug problems. This may be because the brain does not fully mature until about age 25; thus, exposure to drugs may alter its development. Moreover, the last parts of the brain to develop are the ones responsible for decision-making, judgment, and self-control, which helps explain why adolescents are especially prone to risk-taking behaviors, including trying drugs of abuse. Understanding why some people become addicted to drugs and others do not is a complex issue and one that our still-evolving science is addressing. In assessing personal risk, it is important to consider family history, social environment, and age, among other factors. Ultimately, the only way to avoid becoming addicted to drugs is not to use them, since it is not possible for a person to predict whether or when they will become addicted and if they do, how ravaged their life will be as a result. In fact, addiction is only one serious consequence that can result from drug abuse - accidents, disease, and other harms can occur even with a single use. If a person is compulsively seeking and using a drug despite negative consequences, such as loss of job, debt, physical problems brought on by drug abuse, or family problems, then he or she probably is addicted. The physical signs of abuse or addiction can vary depending on the person and the drug being abused. Each drug has short-term and long-term physical effects. And while some of these effects can be seen, others can not. It is therefore important that if you suspect a loved one is addicted, you suggest they seek professional help to determine if this is the case and, if so, the appropriate treatment. Withdrawal is the all-inclusive term used to describe a complex variety of unpleasant physical symptoms that occur when the use of some addictive drugs is reduced or stopped. Detoxification is the process of allowing the body to rid itself of a drug while managing the symptoms of withdrawal. Length of withdrawal and the severity of physical symptoms vary with the type of drug and how long it has been taken. For example, physical symptoms of highly addictive drugs, such as heroin, may not only include difficult physical symptoms that may last for several days, but also general depression, or dysphoria (opposite of euphoria), that can last for weeks. In many cases, withdrawal can be treated with medications to ease the symptoms, but treating withdrawal symptoms and/or detoxifying the body from drugs is not the same as treating addiction - it is only the first step and should be followed by treatment with a behavioral-based therapy and/or a medication, if available. Drugs produce abnormally large surges in dopamine in the brain's reward structures that lead to the "high" drug users often refer to. In response, the brain becomes less reactive to the drug, and the user feels less and less of a "high" from the same amount of the drug - an effect known as tolerance. In addition, because drugs tap into the same parts of the brain involved with natural rewards - such as seeing a good friend or eating a delicious meal - the brain also becomes less sensitive to these types of everyday non-drug-related events and activities. As addiction deepens, the drugs become less an added positive experience and more a necessity for the brain (and the abuser) merely to feel "normal." In addition to the dopamine-release system, or the reward system, long-term drug abuse changes other brain chemical systems that control the ability to learn, to remember, and to exert control over one's behavior. With repeated abuse, a type of conditioning (or non-conscious memory formation) occurs in which a person becomes highly sensitive to environmental cues associated with drug-taking. These cues can include people, places, or even mood states linked to the drug experience. They can trigger uncontrollable drug cravings, even when the drug itself is not available, and lead to relapse in formerly abstinent drug abusers. All of the changes that take place in the brain from repeated exposure to drugs constitute addiction. Brain imaging studies of drug-addicted individuals show such changes in brain areas critical to judgment, decision-making, learning and memory, and behavior control. These changes are what drive an abuser to seek out and take drugs compulsively despite catastrophic adverse consequences. Pregnant women who abuse drugs place themselves and their developing fetuses at risk for negative health effects. Since the fetus' health is directly related to the health of the mother, it is important to consider the negative health affects that drugs have on all people, including pregnant women. In addition, a pregnant woman who abuses drugs may have other risk factors that could adversely affect the health and well being of her child. These can include poor nutrition and health care, lack of prenatal care, and a chaotic home environment. Further, alcohol, nicotine, and other drugs of abuse can directly affect the developing fetus because they travel across or through the placenta. For many drugs of abuse, the long-term health effects are not yet known, or are tangled up with other adverse environmental circumstances associated with drug abuse. Nevertheless, studies show long-term behavioral effects and vulnerabilities to addiction in the offspring of mothers who used drugs (including nicotine and alcohol). Pregnant women should be encouraged to abstain from these substances, or to get treatment as early as possible in their pregnancies. It is a myth that an addict must hit "rock bottom" to be ready for treatment. The reality is, treatment works regardless of whether a person has hit rock bottom; and catching a person earlier in the addiction cycle, may mean fewer accompanying problems and a better overall prognosis for long-term recovery. Further, "rock bottom" is a dangerous place to be, and for many addicts, that point is when a near-fatal overdose or other serious health or criminal justice consequence has occurred. If you think a loved one is in need of treatment, it is advisable to do everything in your power to help them find the courage, determination, and means to seek treatment as early as possible. Yes. Research shows that combining addiction-treatment medications, where available, with behavioral therapy is the best way to ensure success for most patients. Treatment approaches tailored to address each patient's drug abuse patterns and co-occurring medical, psychiatric, and social problems can lead to sustained recovery and a life without drug abuse. It is important to remember, however, that drug addiction is a chronic, relapsing disease - like diabetes, asthma, or heart disease - that can be managed successfully. Treatment helps people to counteract addiction's powerful disruptive effects and regain control of their lives. And just as with other chronic diseases, relapses may occur but do not signal failure; rather, they indicate that treatment should be reinstated or adjusted to help the person fully recover. Treatment will vary for each person, depending on the type of drug(s) abused. Often, multiple courses of treatment may be needed to achieve success. NIDA's Principles of Drug Addiction Treatment: A Research-Based Guide describes 13 basic principles that underlie effective drug addiction treatment based on 30 years of research. NIDA has also recently released a treatment guide for criminal-justice involved populations, with research-based principles aimed at decreasing drug abuse and criminal recidivism: Principles of Drug Abuse Treatment for Criminal Justice Populations - A Research Based Guide. For referrals to treatment programs, call 1-800-662-HELP, or visit the Substance Abuse and Mental Health Services Administration online at http://findtreatment.samhsa.gov/.